Lighter protective clothing, tougher helmets, more stable protectors: New materials with up to 20-per-cent-better protective properties are the result of the BISS research project headed by the BMW Group. What is unique is that all advances are based on designs borrowed from nature – BISS stands for Bio-Inspired Safety Systems. The consortium of seven partners spent three years researching and developing alternative design and material concepts for the bionics project. The BMW Group worked alongside adidas, ORTEMA, phoenix and uvex, as well as the Institute of Textile Technology and Process Engineering Denkendorf, Germany, the Department of Polymer Engineering at the University of Bayreuth and the Plant Biomechanics Group of the University of Freiburg, with additional support from partners such as the company Innovationsmanufaktur in Munich. The German Federal Ministry for Education and Research subsidised the project as part of its “Technical Textiles for Innovative Applications and Products – NanoMatTextil” programme. Biological models like the pomelo fruit benefit from highly effective impact protection. So, even when it falls from a high tree, for example, the fruit does not split open and the insides remain largely undamaged. Its rind is also extremely light. Another example: The scales of fish and many reptiles overlap to create a composite system that stiffens under load to provide protection against injury. Alligators’ protective armour, on the other hand, works in part by distributing force to neighbouring scales. The initial aim of the research project was to analyse the tissue formation, cell structure and functioning of these protection mechanisms and explore their suitability for use in industrially-manufactured products. From there, the next step was to refine the corresponding fibre composites, layer structures and fibre orientation. The project then went on to examine how functions that had previously been difficult to reconcile, like “crash protection”, “penetration resistance” and “damping”, could be combined in innovative protective systems using layering modelled on biological structures. The results now available have exceeded expectations: Prototypes designed from natural models are up to 20 per cent lighter, tougher and more stable than materials generally used today. They can be produced economically and processed for the intended purposes. The high level of functional efficiency achieved by biologically-inspired protective equipment also saves material. This not only makes both product and production more sustainable, but also less expensive. Technology-forecasting experts at the BMW Group believe the most important learnings for the company lie in new approaches for enhanced employee protection. Gloves and protective inserts made from bionic materials, for example, can protect workers on the assembly line from sharp-edged car-body parts. The low weight, breathable design and flexibility of the research models mean that movement is barely restricted. Other potential applications include new forms of protective equipment for motorcyclists. Research models of crash helmets and protectors offering the same level of protection weighed considerably less than conventional models available on the market. Sporting goods manufacturers have also identified significant advantages for their products. 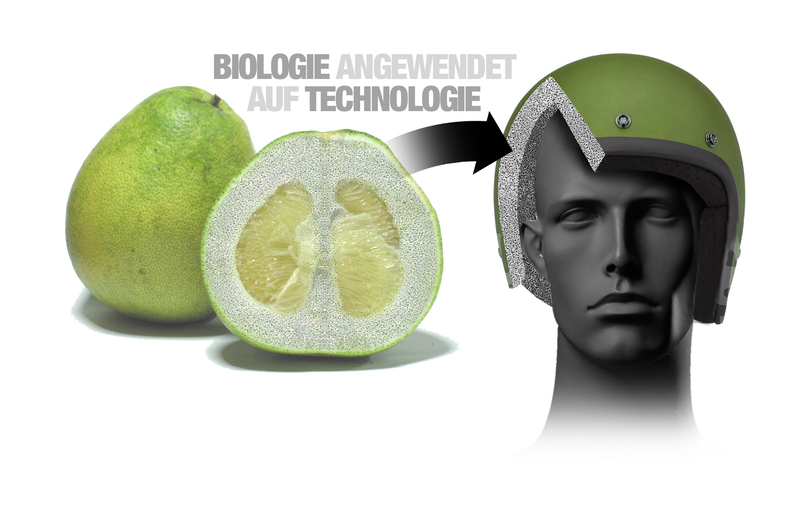 As part of the project, uvex developed new design principles based on biological models and created a new kind of cushioning material for ski and bicycle helmets. With cushioning properties 10 to 20-per-cent better than conventional materials, this will create even safer helmets that exceed safety requirements. Adidas also believes the research opens the door to creating future protective clothing for basketball and football players, for example. ORTEMA sees major opportunities for innovative equipment for athletes in the findings. 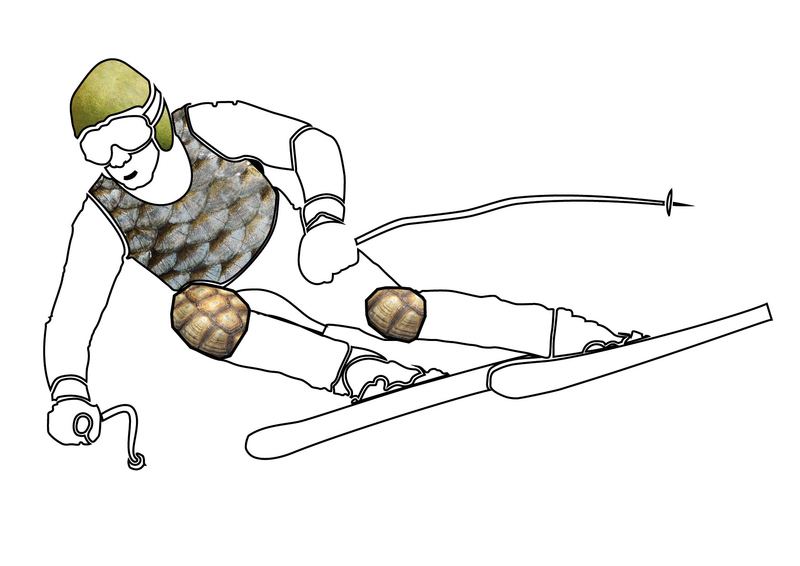 Through the development of biologically-inspired materials, the manufacturer of special sports equipment, individual orthotics and high-end protectors for numerous sports was able to further improve the protective features of many of its products and, at the same time, meet the high ergonomic demands for protective sports gear. phoenix, a specialist for product development using 3D data and 3D printing, also participated in BISS. The service company developed special production concepts to enable products to be manufactured economically from innovative materials. In modern manufacturing processes, especially Additive Layer Manufacturing (ALM) and rapid manufacturing, production is controlled directly using 3D product data. The unique protective properties of biological models essentially lie in their hierarchical design. The rind of the pomelo is one of these so-called auxetic materials, which responds completely differently to pressure than conventional structures: Where conventional material gives way and becomes thinner under the pressure point, auxetic material compresses and hardens faster. A further characteristic of this atypical stress/strain behaviour is that the material actually becomes thicker when stretched, rather than thinner. Within BISS, researchers have now managed to decipher the unique structure of auxetic natural protection and use newly-developed methods to transfer it to the structure of foams. This makes it possible to produce composite textiles with a protective effect not previously achieved. These insights are primarily based on the scientific principles established by research partners at universities and colleges. As part of the project, the Department for Polymer Engineering at the University of Bayreuth worked with the Plant Biomechanics Group Freiburg to conduct research specifically into the creation of auxetic structures and verify whether this concept could be transferred to commercial foam systems made of polyurethane (PUR). Specific structure-property relationships were also modelled to better understand how the degree of auxetic behaviour affects the mechanical impact behaviour of foams. The results show that conversion of the foam network from ordinary to auxetic structures has a positive effect on the materials’ cushioning properties. The stresses occurring during compression of auxetic polyurethane in the material are distributed optimally into previously unused, surrounding areas using the auxetic effect. In this way, a larger volume of the material is involved in the energy absorption compared to ordinary PUR foams. The Institute of Textile Technology and Process Engineering (ITV), which forms part of the German Institutes for Textile and Fibre Research, has extensive knowledge in the field of textile technology and bionics from a large number of projects. As part of the project, ITV was intensively involved in development and design for new textile and foam hybrids. Mesh weaving technology was modified to enable the textiles to withstand the pressures of the foaming process and, at the same time, allow complete foam-filling. The specially adapted mesh fabric, combined with the foam, improved properties by nearly 25 per cent. The Plant Biomechanics Group at the University of Freiburg has been conducting research in the field of biomechanics and functional morphology of plants for more than 15 years. The working group belongs to the Baden-Württemberg Competence Network Biomimetics and has been focusing for the past six years on biologically-inspired crash protection, with the aim of utilizing fibre-reinforced metal foams. Experience from this research was shared and refined in the BISS project, allowing know-how to be successfully transferred to biologically-inspired polymer materials and material systems. Innovationsmanufaktur GmbH, based in Munich, supports the research project as an associated partner. For the BISS project, which needed to reconcile the diverse interests of industry and research, they provided a holistic approach for project and innovation management.